##Important##: The pics in each level will appear in a different order each time you play the game, so you’ll probably see a different order on your device than what I have below. Alternatively, to find the answer to a specific pic, you can browse the answers to all pics in that particular level. To see the actual pics just click on the link beside an answer. 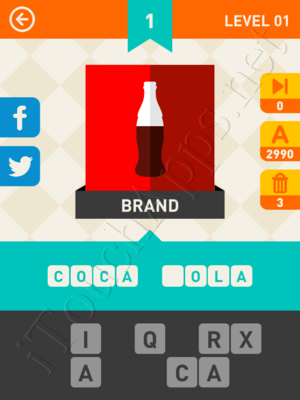 Icon Pop Mania was developed by Alegrium, the maker of the very popular games Icon Pop Brand and Icon Pop Quiz. The game involves showing you a picture in each level and requiring for you to spell out what the picture is, using the letters provided. The pics fall under lots of different categories, including City, Country, Brand, Character, Famous People, and TV & Movies. You have the options of skipping a level, revealing a letter, or trashing redundant letters (in-app purchase required for each option) to make your job easier.